At first sight Frankie Dettori Slots doesn’t look that special. Why? Well, because there is nothing really special about it except its unique history. But it can be still entertaining for those gamblers who can’t choose between slots and horse betting - it offers you 5 reels, 25 paylines and an opportunity to get some free spins. 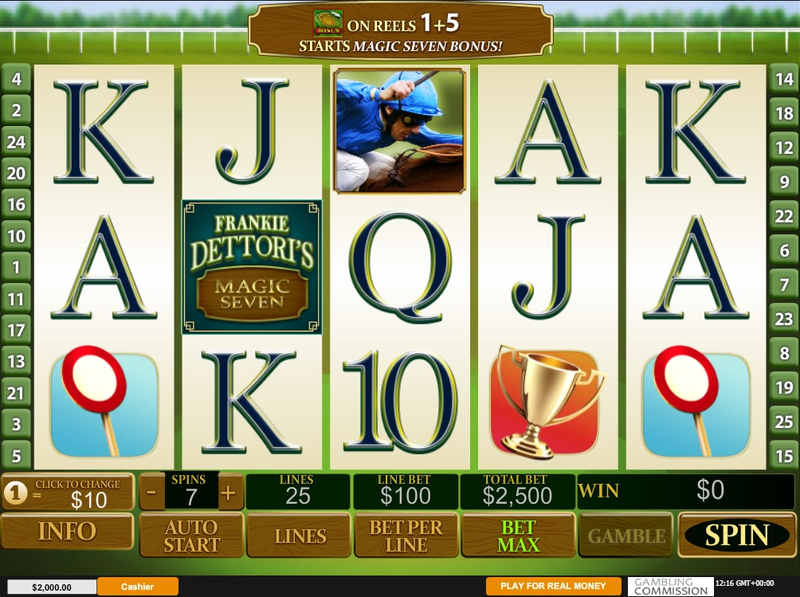 Frankie Dettori Slots were created by Playtech. This game was inspired by Frankie Dettori, a really cool jockey from Italy. In 1996 he managed to win seven races during one afternoon. Impressive, right? Well, that was exactly what Playtech thought. “So, this slot has 5 reels and 25 paylines about horses, racing and that guy Dettori”. You will even hear music and typical sounds of the race while playing. Moreover, you’re allowed to adjust the quantity of active paylines, the number of the wagered coins and the coin size for each bet. The wild symbol is Frankie Dettori (yeah, his portrait), and the scatter one is Frankie Dettori’s Magic Seven. Okay, no more history - our article has finally reached the most interesting part of any slot review. So, first of all, let’s talk a bit about the wild symbol. The picture of Frankie Dettori can stand for any symbol except the Bonus and the Scatter ones. Apart from this, you get a special payout in case there are two (or more!) Wilds in an active payline. Secondly, Scatters. Two or more scatter symbols in the results of the spin will reward you with extra winnings - the payout you have earned will be multiplied by the total bet. By the way, three or more Scatters also active free games. And, finally, the bonus symbol (there is a huge word “bonus” written on it, so you won’t miss it), appearing in the first and in the fifth reel at the same time triggers a so-called Magic Seven Bonus. If you decide to try it, you will have to pick spots on the horse race track. This will allow you to win cash prizes. In total, there are 20 spots on the track, and the maximum possible amount to win is 280 times the total bet of that spin which activated the bonus. And if you reveal Collect spot, your bonus winnings will multiplied by the current multiplier, which is, obviously, not more than 7. By the way, if you are lucky enough to get a winning combination, you will see the button saying “Gamble”. And if you click it, you will get a chance to double your payouts. And one more thing - to get free spins you have to choose a horse. There are three of them, but you need only one. If your horse takes the first place, you receive 35 spins. If the second or the third one - 15 or 10 spins respectively. Well, you may like this game in case you love horse racing. And it has a really cool history! Although, this fact is not really important for your winnings. But what is really important is the fact that Frankie Dettori Slots offer free spins. But, unfortunately, there is no progressive jackpot, only the fixed one, which is 7777 times your bet. Anyway, follow this link to try the slot yourself.